BUNKER BREAKER II is a highly-effective demulsifier for removing water from bunker oil waste, but it can also be used for demulsifying water from slop oil/lube oil/crankcase oil waste. BUNKER BREAKER II is already being used by major waste oil treatment companies to reclaim oil for recycling into reusable bunker fuel oil, etc. Waste bunker oil must be preheated to a minimum of 90°C and lube oil to a minimum of 75°C to 85°C, with either mechanical or air agitation. 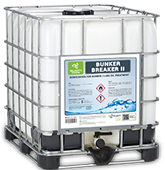 While agitating, a typical starting concentration of 2,500 ppm to 3,000 ppm of Bunker Breaker II is recommended. Mix in Bunker Breaker for about 30 minutes at recommended minimum mixing temperature. Then, allow waste to gravity separate into its layers (i.e. water layer on bottom and oil layer on top). Decant water layer and reclaim oil layer for recycling. To obtain a more accurate dosage for your waste oil treatment, conduct a ladder bench test with a dosage range of 500 ppm to 5,000 ppm of Bunker Breaker II.